HDMI Splitters | Simply Connect Pte Ltd. 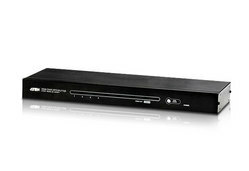 The VS1814T HDMI over single Cat 5 Splitter provides a fast and efficient way of switching high definition video from one input source to 4 displays. The VS1818T HDMI over single Cat 5 Splitter provides a fast and efficient way of switching high definition video from one input source to 8 displays. The VS1808T HDMI Over Cat 5 Splitter is a splitter designed to connect one source to 8 displays over a long distance. Incorporating suggested compatible receivers *. The VS1804T HDMI Over Cat 5 Splitter is a splitter designed to connect one source to 4 displays over a long distance.